Day 2: Hiking in on the North Fork Big Pine Creek Trail, we visited First Lake, Second Lake, Third Lake, Sam Mack Meadow, and the Palisade Glacier. It was a very long day. We woke at first light and ate a hurried breakfast. We managed to get everything packed before dawn, which was exactly what we’d planned. We had more than ten miles of hiking and 5000 feet of elevation gain to accomplish, and it wasn’t going to happen by luck. We knew that if we could pull this off, the rest of the trip would be relatively easy. We were pretty confident that we could do it (thanks to our practice trip two weeks earlier), provided that we started hiking early enough in the day. And that’s why we got up so early. 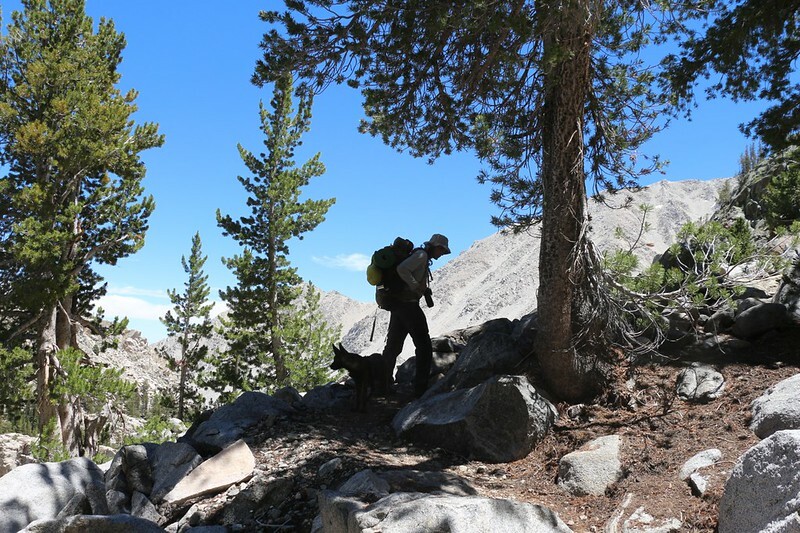 It seems that every hike in the Sierra Nevada begins by heading uphill. It’s simply inevitable that you’ll start sweating and breathing hard right away. And this trail was no different. But we sure were glad that the sun wasn’t high enough to roast us, at least not right away. The air was pleasantly cool, and, to tell the truth, getting warm while climbing was actually welcome. The first section of trail followed an old road up on the right side of the canyon, and the views were great as there wasn’t much vegetation. 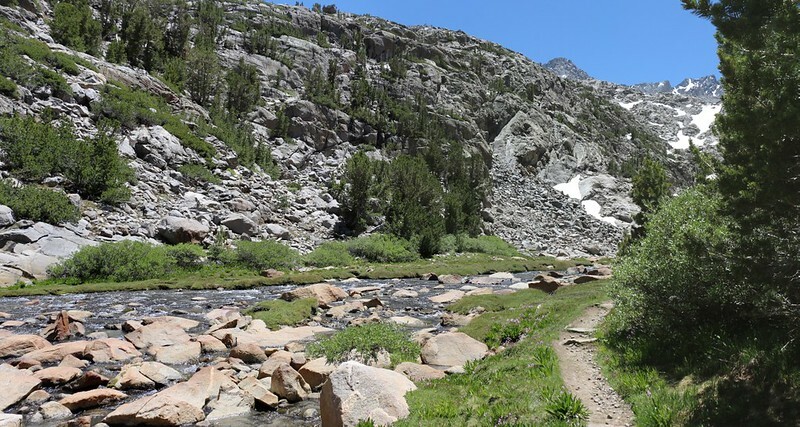 Soon the road veered off and the narrow trail continued into the John Muir Wilderness just before Second Falls. We took a short break at the top of the falls, but it turned out that the best view of it was from far away down the canyon. We didn’t bother to explore this area but instead moved on through a narrow gorge that the creek had carved. The water was flowing strong beside the trail. The trail generally followed the creek, but mainly stayed at a comfortable distance. We hiked uphill through a lovely pine forest for an hour or so, until we came upon a stone building next to the creek. 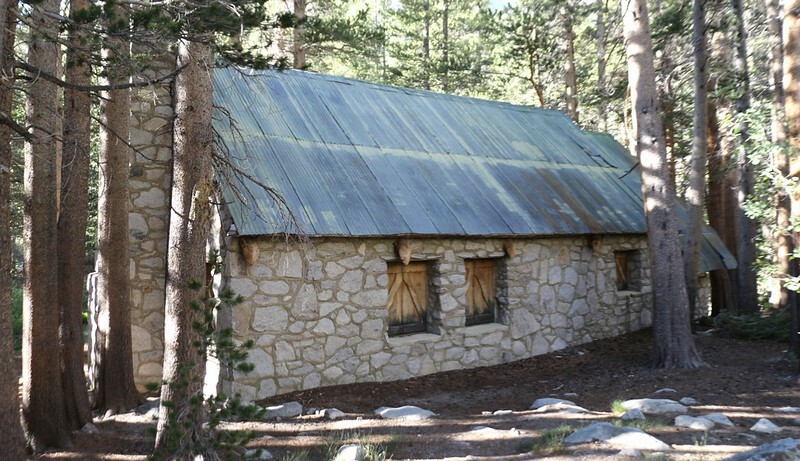 This turned out to be a backcountry Ranger Station, but it was all locked up. It would have been fun to check out the inside, but we satisfied ourselves by taking a longer break along the creek which was right outside its front door. We filtered some more water and ate a bit more snack, then continued onward. We’d only hiked two miles and had quite a bit further to go. About a mile further we got our first view of Temple Crag. Up until then we’d been stuck down in the bottom of the canyon, but now it began to open up, and we could see some serious granite in the distance. Oh, yes! 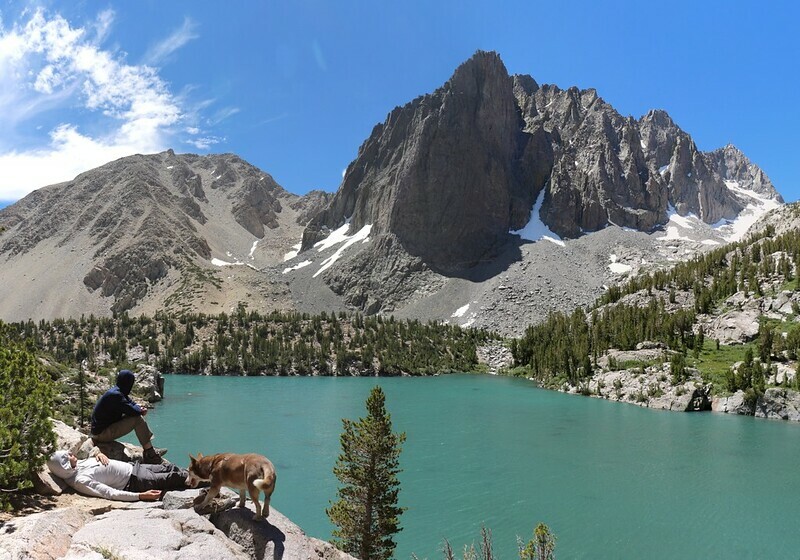 This is why we hike this hard. And we knew that it was only going to get better as we climbed higher and higher. 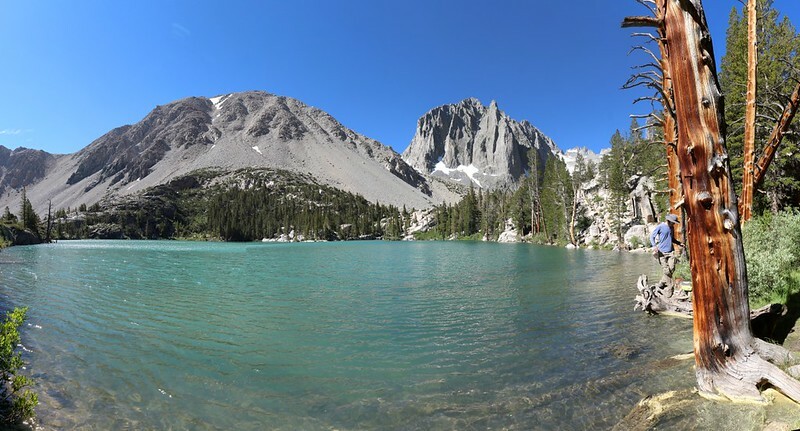 Finally, after four miles of hiking and about 2000 feet of elevation gain, we entered the main basin area, and came upon the first of many lakes. In fact, its name was “First Lake.” And that was only the beginning. The original explorers didn’t have much imagination, it would seem, because they named the lakes this way all over the basin, continuing the sequence in this fashion until they reached Seventh Lake. Boring but true. But the names didn’t matter much to us; what mattered most was the beauty that we saw. We didn’t stop for long, and continued onward to Second Lake. 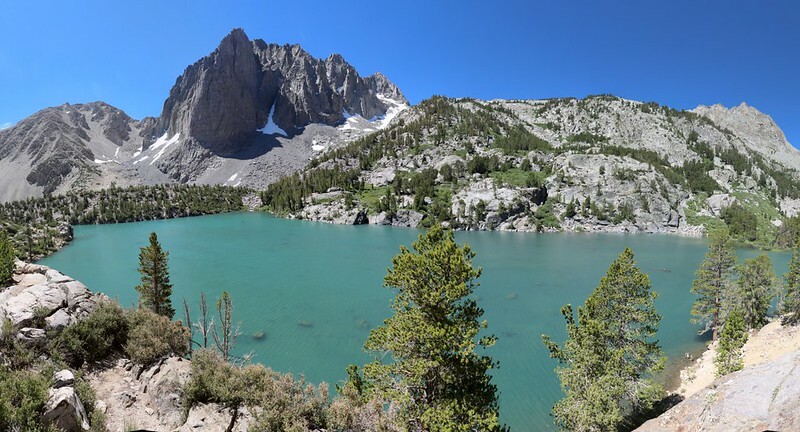 This lake was probably the most “famous” in that an incredible number of online photos were taken here, primarily due to the proximity of Temple Crag, which provided a dramatic backdrop to the turquoise waters of the lake. 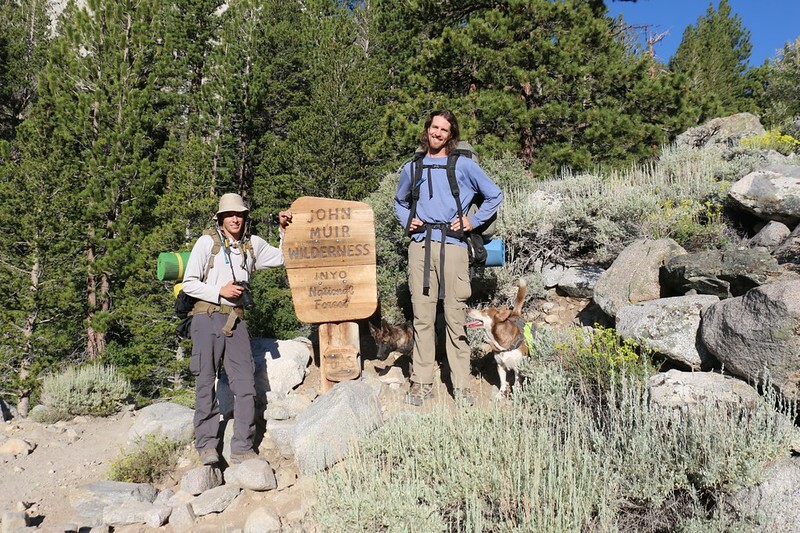 It was also about as far as the typical backpacker could hike in a day, so they tended to camp near here. And who could blame them? It was truly gorgeous. We stopped for an extended break and took tons of photos, posing in every possible combination of dogs and humans that we could think of. It was still early, so we continued onward to Third Lake, which was also incredibly picturesque. It wasn’t quite noon, but we’d been hiking for almost five hours, so we decided to stop for lunch. A lunch with a view. I took off my shoes and aired out my sweaty socks while reading my book and contemplating nature. This was what made all those hours spent at the office worthwhile. Or so I tell myself. But really I think I’d like to stay up by that lake, or countless other lakes, rather than go back to work. I resolved to come up with a plan to do just that. Maybe I’d start next Summer, after I’d saved up enough vacation time. Sad but true. But seriously, there had to be a way. Finding it was the problem. We were still feeling strong after lunch, and that was a good thing, because we had a whole lot more climbing and hiking to do. Just past Third Lake, we headed west on the Sam Mack Meadow Trail. 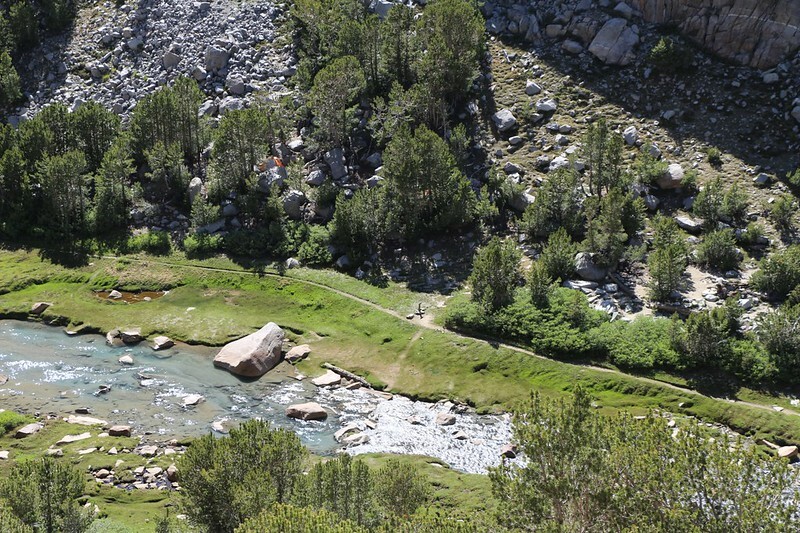 This trail climbed up and out of the main basin, generally following the outflow stream from the meadow. It was only a mile or so further, but it was steep and much less traveled. It was hot, and we paused regularly in the shade of the occasional tree, letting the breezy updraft do its work. Sadly, it didn’t take long for lunch’s energy boost to wear off, and our legs grew tired and sore. But we kept on hiking anyway. 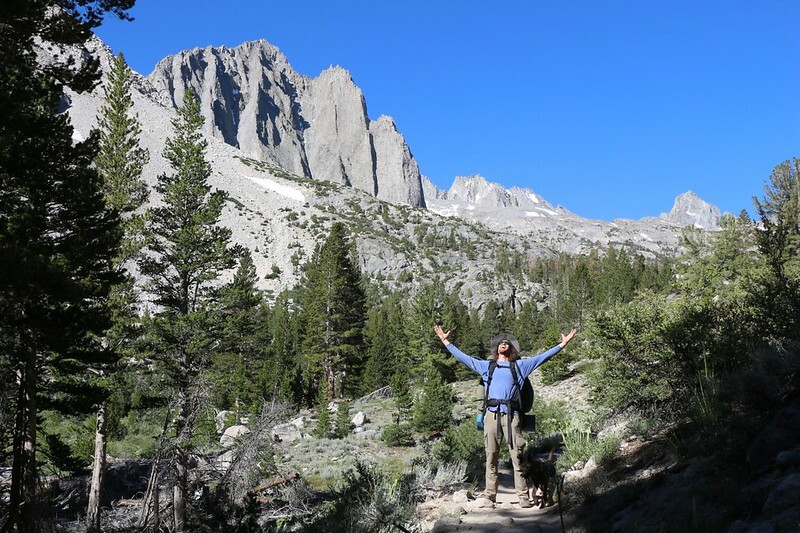 It was still early afternoon when the trail leveled off and we arrived at Sam Mack Meadow. We walked around the corner and there it was: A small meadow tucked away in a hidden valley, surrounded by granite walls and patches of melting snow. The water in the stream was flowing strong, and it was icy cold. But the air was warm, the sun was shining, and life was good again. 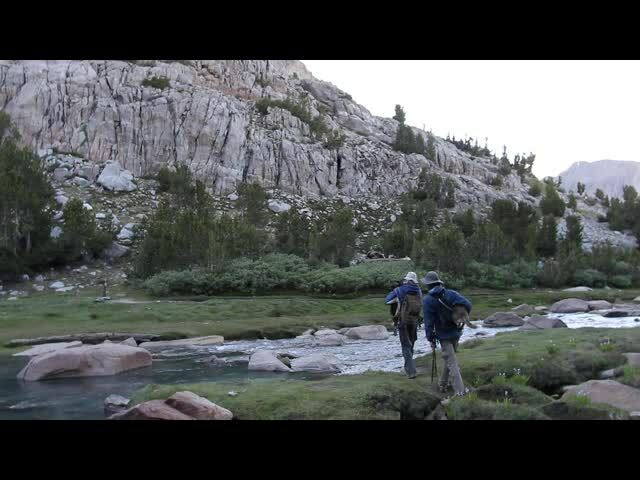 We set down our packs and relaxed for a while on a big boulder near the stream. Then I wandered along the side of the meadow and searched for a campsite, but it turned out that the best spots were right where we’d stopped, just uphill a bit within some limber pines. So we set up our tents and filtered enough water to last until tomorrow morning. The usual daily chores, in other words, but in a beautiful setting. 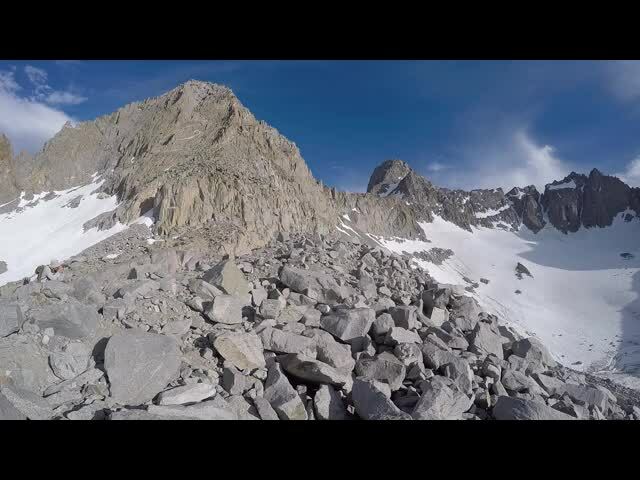 It was nearly 4pm when we began the final, crowning hike of our long day: To the Palisade Glacier. Now, Sam Mack Meadow was pretty high, at 11,000 feet elevation, but the trail to the glacier climbed all the way up to 12,300 feet. This was a lot to ask of our sea-level lungs, but we decided to go for it anyway. 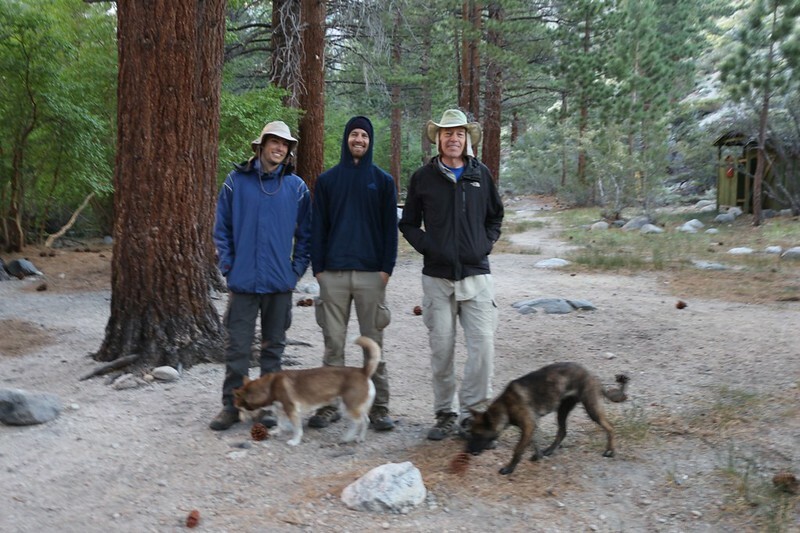 Let’s face it: we were hoping that camping the night before at 8,200 feet would’ve been enough to acclimatize us a bit. 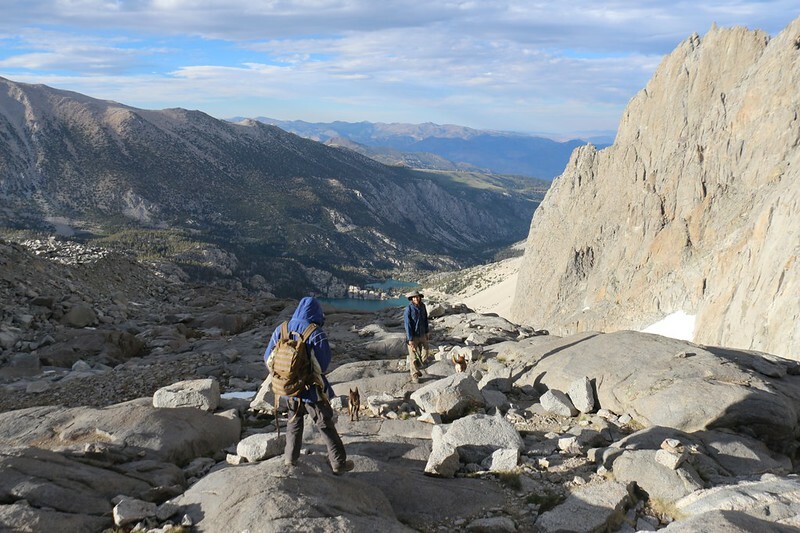 We packed only the ten essentials and hiked as light as possible. We rock-hopped across the stream and the trail began switchbacking up the south side of the valley. We got some great views down into the meadow, and could see our tents down below. More mountain peaks came into view as we climbed higher. 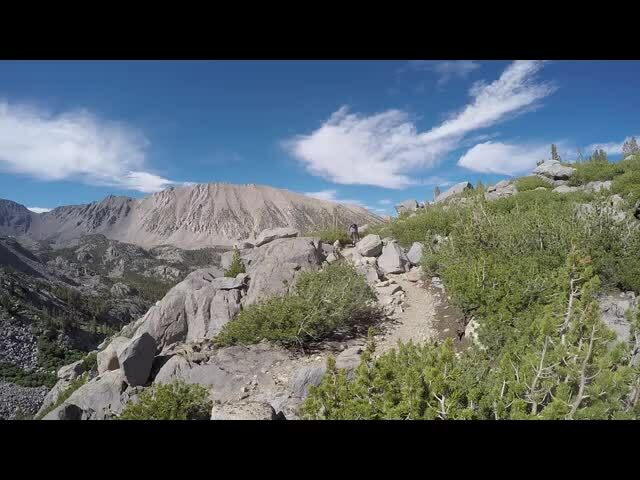 Once the trail gained the ridgeline the views really opened up. 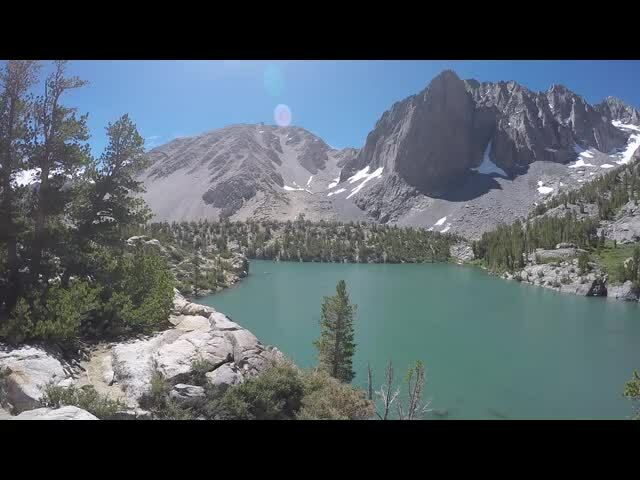 We could look down at First, Second, and Third Lakes, as well as get a great view of the entire Big Pine Lakes Basin. It was absolutely stunning. I kept stopping to take more and more panoramic photos, and was seriously beginning to slow everyone down. Not that they were complaining. This was precisely why we’d hiked so hard all day. It didn’t take long before the trail completely disappeared. And it wasn’t due to snow, although there was plenty of it. It was because the trees couldn’t go any higher, and the land was mainly composed of granite slabs and huge boulders. The only guidance we had was a vague line on my GPS and a number of rocky cairns placed by previous hikers. This was a “find your own route” sort of trail. So we hopped and scrambled our way up the ridge, avoiding the icy, slippery sections and keeping to good dry rock whenever possible. By the time we attained 12,300 feet our legs were getting extremely tired. We were stopping more frequently for rests. And the annoying trail stayed just to the east of a ridge of rocky moraine, thereby blocking any view we might have of the glacier. It was frustrating. After consulting the GPS we decided to give up on the so-called “trail” and simply climbed directly up the steep pile of talus to the ridge top. We were breathing hard, and our hearts were thumping, but we crested it! 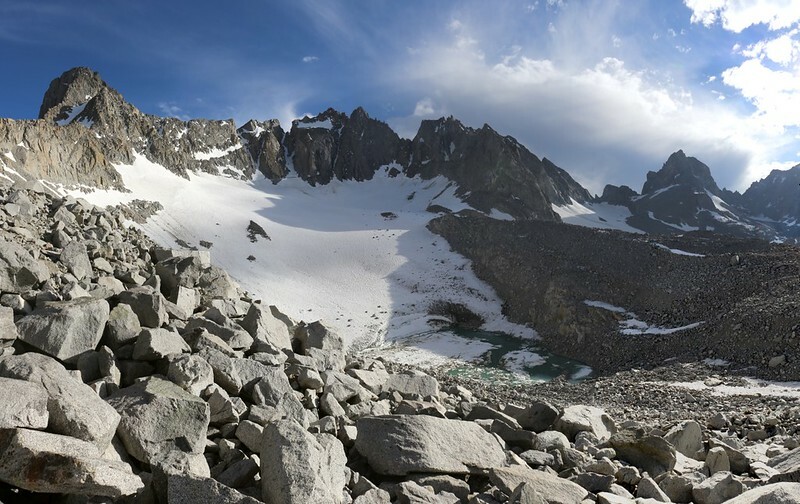 And there it was, the Palisade Glacier, the largest glacier in the Sierra Nevada. 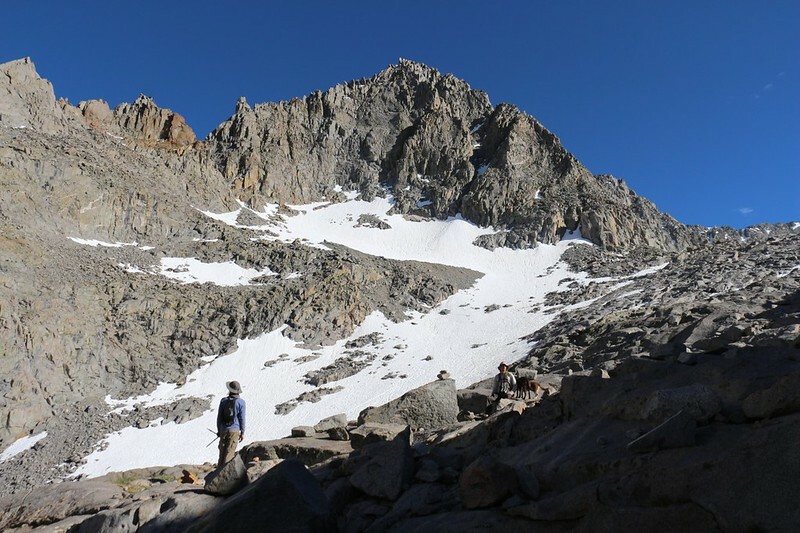 Towering above it were some of the toughest fourteeners in California, and at its base was an ice-filled lake. Up at the top we could see the bergschrund, where the glacier left behind a crevasse as it pulled away from the steep rocky chutes leading up to the Sierra Crest. 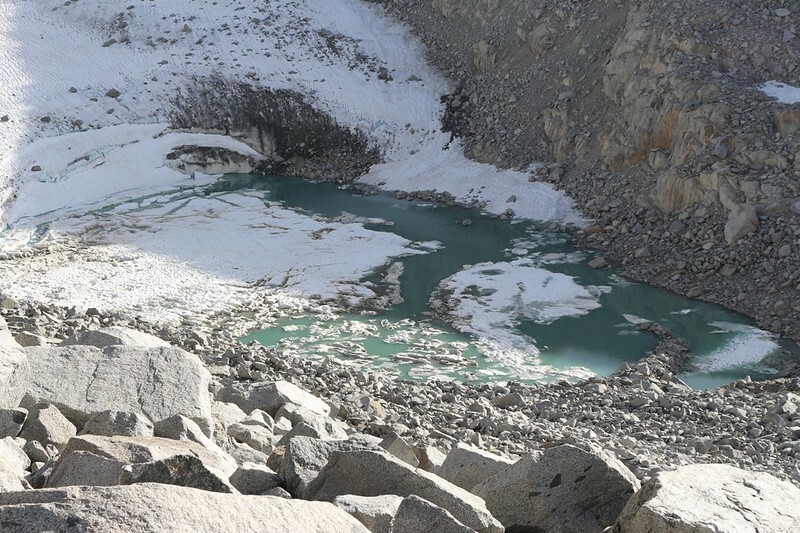 All around the basin by the lake were huge piles and ridges of tumbled talus (the glacial moraine), which were left behind after recent ice ages ended and the glaciers gradually melted away. 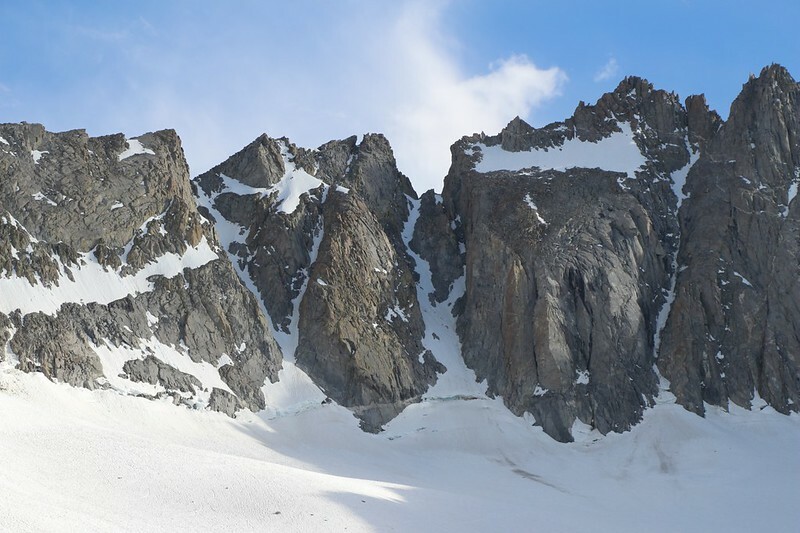 Our original plan for this trip included spending an entire day climbing up the glacier with ice axes and crampons, but time constraints had us shrinking the trek by a day, and unfortunately the glacier lost out. But at least we found the energy to climb this far and see it up close and personal. 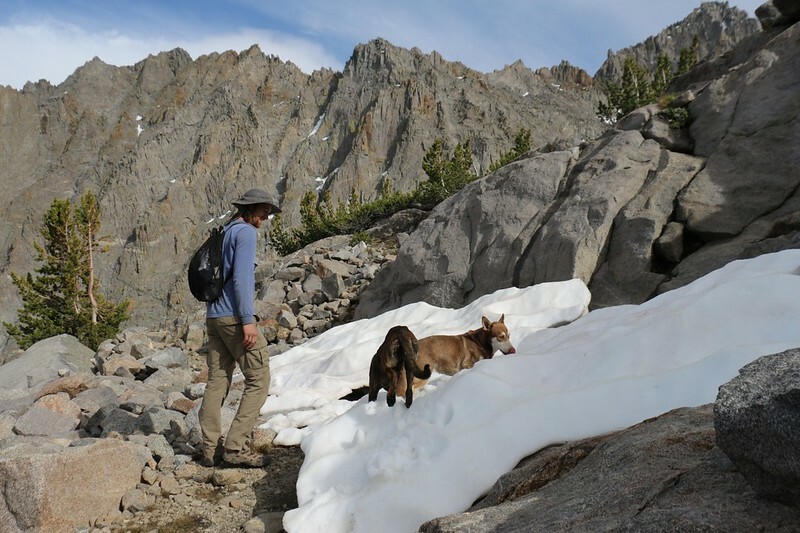 We also weren’t sure how the dogs would like climbing the glacier, but if last year’s trip to Humphrey’s Basin was any indication, they would have enjoyed it even more than us. So we took a good long break up there and enjoyed the view for awhile. But soon enough the evening shadows began lengthening across the glacier, and the air began getting cold. It was time to head back to camp and eat some warm dinner. Good-bye glacier! It was almost 8pm by the time we got back to camp. All told, we’d been hiking close to fourteen hours (including plenty of rests) that day, from dawn to dusk. 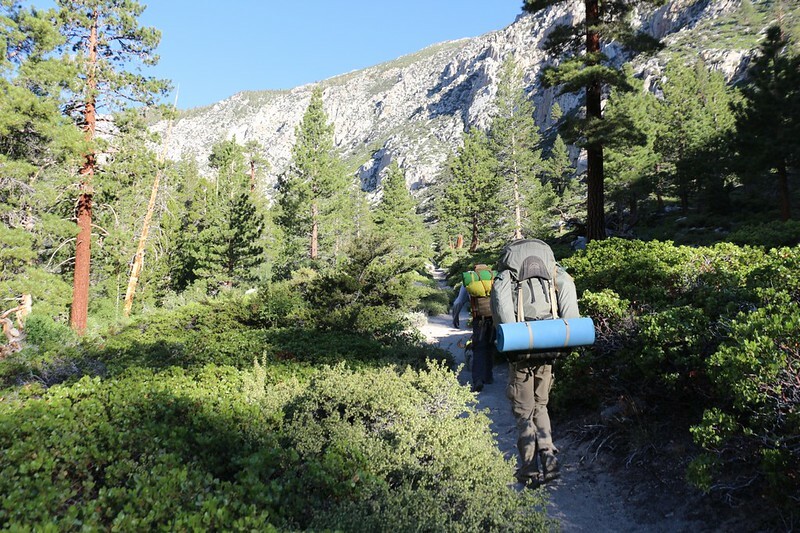 According to the GPS, we had hiked 10.5 miles and climbed 5300 feet, with three quarters of it carrying full backpacks. As we ate dinner, we congratulated each other on how fit and awesome we all were, even the dogs. But most of all we were totally stoked on how beautiful this hike had been. Waterfalls and lakes and glaciers and towering mountains, this place had it all. 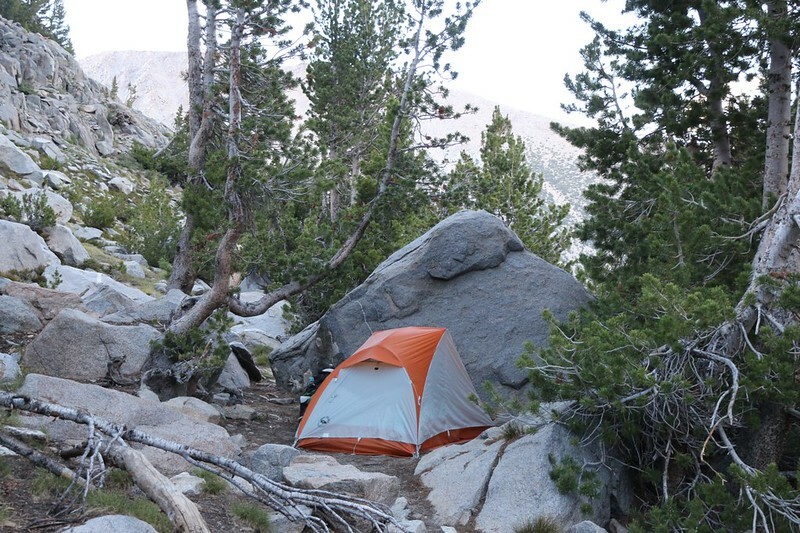 As the temperature dropped and the light faded, we headed into our cozy tents. We had a feeling that we were going to sleep very well that night!